“An ounce of prevention is worth a pound of cure,” says Hannah Colby, Aitkin County’s Statewide Health Improvement Partnership (SHIP) coordinator, quoting Benjamin Franklin. Formerly a clinical dietitian, Colby noticed a “revolving door” trend of clients who made eating changes to address chronic conditions—but often found themselves back in the clinic with repeat or new issues. So she turned to preventative work. As the county’s SHIP coordinator, Colby collaborates with Healthy Northland, which comprises the health boards of the seven northeastern Minnesota counties, to promote and educate for active, tobacco-free living and healthy eating among more than 300,000 area residents. 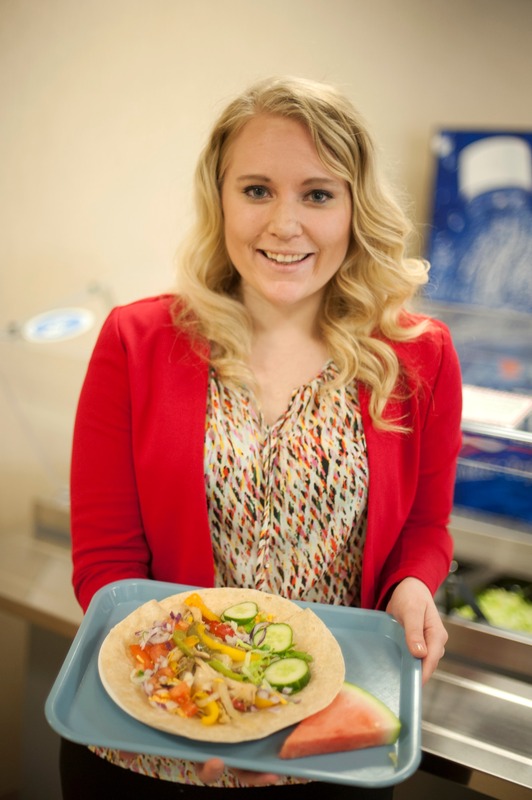 She’s focused on strategies to promote healthy eating in local schools and the wider community, including a farm-to-institution program through Riverwood Healthcare Center, the local hospital, and a monthly meal made from scratch through an Aitkin County farm-to-school program. “We know that kids who have a good healthy, nutritious meal learn better,” she explained. Each month during the school year, typically on the third Thursday, school lunch staff prepare a meal with mostly farm fresh, locally-sourced ingredients. Last month focused on pork. “Our school staff gets creative,” she said. A favorite meal in the past school year was farm fresh meatballs with gravy and mashed potatoes, with ground beef from Oles Acres (Aitkin); ground pork from Willow Sedge Farm (Palisade); and potatoes from Gun Lake Potato Farm (Palisade). The schools invite the featured farmers to come and talk with the students so the kids can ask questions and learn where their food is being grown. The monthly meal is popular with parents, who are invited to dine with their students for a small fee. “It’s a shared family experience. Lots of parents love this program,” Colby said. Healthy eating is indeed a lifelong goal. Colby says that social factors such as access to healthy food are a major contributor to people’s health. So Riverwood is modeling healthier lifestyles by serving farm fresh food once a month all year. The hospital’s staff departments even take turns helping with the monthly meal—de-seeding peppers or husking corn, for example. It’s a team-building and fun opportunity for staff, and their efforts make it possible to prepare large quantities of fresh food in a safe and timely manner. Right now, Colby’s working with school food service directors to draft next year’s menu. Besides continually introducing new fruits and vegetables, the idea is to add a healthy twist to foods kids already like. For example, fresh locally grown peppers can be frozen and later added to barbeque chicken pizza or chicken chili. Then, there’s the procurement process involving requests for proposal, a scoring system, and contracts to manage. Colby says school and hospital staff are invested in making the process work. “Our food service staff takes the extra time to do this procurement process—we have great food service teams in the schools and institutions,” Colby said. One point of pride is that the county’s programs include local meat and eggs, not only local produce. And, kids have a say in what goes on their plates. In a new pilot project complementing the farm-to-school program, kids can taste-test vegetables or fruits and vote whether they like or dislike them. This plan should also reduce plate waste, as the menu will include foods the students have chosen themselves. Next up: Brussels sprouts prepared with honey and dill. Sweet potatoes and butternut squash could follow next fall. “I don’t want them to love it. I want them to try it. It takes a kid 10 to 15 times to decide if they like that food or not,” Colby explained. What’s next on Colby’s plate? Helping with Aitkin Bike Day events (including a stationery blender bike whereby pedaling powers smoothie-making); a newsletter for parents featuring the food of the month and kid-friendly recipes; working with district staff on new school wellness policy language about healthy eating. And, collaborating with a colleague from the Minnesota Institute of Sustainable Agriculture to write a toolkit with how-tos and regulatory information so other school districts can more easily replicate some of Aitkin County’s practices.